South African snack fare --- pies, organic house-cured biltong --- yields a lively bar scene in Ponce City Market. 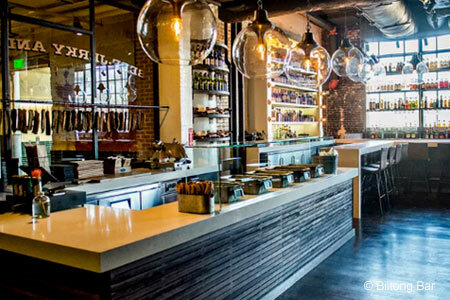 : Restaurateur and South African ex-pat Justin Anthony of 10 Degrees South, Yebo and Cape Dutch is behind Biltong Bar at Ponce City Market. A perfect after-work gathering spot, Biltong Bar packs a small space with twosome tables and a few four-tops for groups. Seating at the bar is good for singles. The menu of South African snack fare starts with the bar’s namesake house-cured all-natural biltong, similar to beef jerky, made from certified Angus beef eye round. You choose the seasoning --- traditional, peri-peri (hot) or garlic --- and fat on or fat off. South Africa likes its hand pies, and these come filled with a variety of traditional tastes, accompanied in several cases by peach chutney. Try the one with the iconic South African curry-scented bobotie (and get it with dried fruits). This one is good, but could use a bit more in the curry department, we think. Boerewors, the classic sausage, is done in rolls. Larger plates are designed for sharing, and none gets past the $15 mark. The wine list is short, but it’s all South African.